India Tourism Development Corporation Ltd. (ITDC) the public sector undertaking under the aegis of Ministry of Tourism, Govt of India organised a session on empowerment of women through spirituality at its flagship institute- the Ashok Institute of Hospitality and Tourism Management (AIH&TM), one of the premier PSU Hospitality Training Institutes of the country. The session also helped in enlightening the consciousness for the power of positivity and self-reliance through self discipline, meditation and that we should always believe in ourselves. 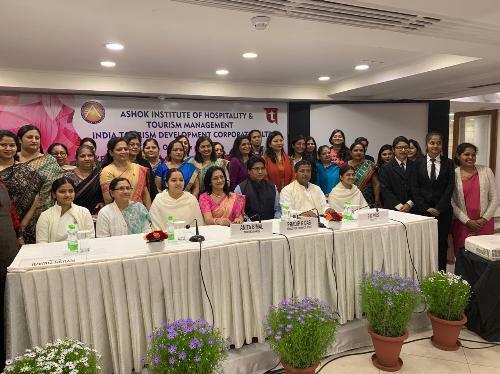 The session was attended by Mr. Piyush Tiwari, Director (Commercial & Marketing), ITDC; Mr Pradip Das, Director Finance, ITDC; Mrs. Anita Bimal, Principal, AIHTM, & GM HRD, ITDC and other senior officials , women of the organisation & students of AIHTM.